One of the first things that comes to mind when one thinks of utilities is the street light. They light up the normally dark spaces of streets and add safety near curves and intersections. Trouble is, most streetlights are energy wasters and operate in just one light intensity. In 2012, the U.S. spent over $160 billion on residential outdoor lighting. Sun-Tracking Solar-Powered LED Street Lights have the potential to significantly reduce this expense because they not only employ low-power LED lights but they fully exploit the power of free solar energy. While street lighting provides safety for vehicles, bicycles and pedestrians, it draws considerable power from electrical grids and often comes on too early or stays on after sunrise. Sun-Tracking Solar-Powered LED Street Lights are self-sustaining devices, designed to replace the existing streetlights. They feature built-in sun-tracking mechanisms to ensure they gather the most solar energy during daylight hours. Sun tracking also means that the lights instantly respond to darkness to ensure they operate when they are needed most. Both modes of operation meet the needs of municipalities while saving energy. By virtue of their design, Solar LED Street Lights can reduce the consumption of electrical grid energy and foster the drive toward more renewable energy sources. Leveraged by the sheer numbers of streetlights across the U.S., these lights can significantly impact energy consumption and spearhead the use of more clean energy. Employing LED lights that consume just 25 watts, the street lights provide the light intensity municipalities need with the power savings they want. Today’s sodium-based light bulbs consume up to 144 watts in 13 days; LED lighting consume as little as 41 watts during the same period. Protracted over a year, the savings can be quite substantial—up to 70 percent or as much as 400 kWh per annually. Statistics bear out the fact that LED lights last longer and shine brighter than ordinary light bulbs. (Many cities no longer allow the sale of incandescent bulbs.) It simply makes sense for today’s municipalities to switch to LED lighting and to power them with solar energy. They consume less power, draw on sustainable energy and require less maintenance. 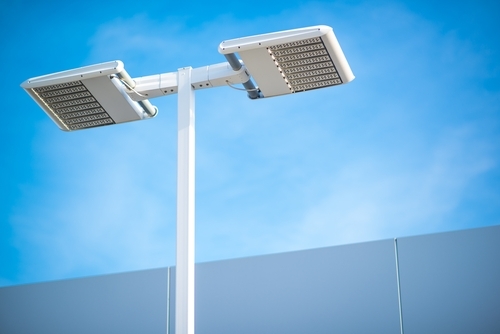 Sun-Tracking Solar-Powered LED Street Lights employ a range of tech enhancements that make them highly efficient. These include sensors, microcontroller, and linear actuator that drive and monitor the light’s sun-tracking ability. Positioned at 45-degree angles from the solar panel, sensors are able to capture maximum light energy from the sun. A comparator output from a specially designed chip helps orient the panels to the source of the most light. A microcontroller directs the switching circuit to control the linear actuator, which uses both positive and negative voltages to extend or retract. If the center sensor receives the most light compared to the side sensors, the system stays put. The microcontroller activates the actuator for 1 minute every 30 minutes to ensure the solar panel won’t rotate past its limit. This also prevents the battery from discharging too soon and conserves electricity. The control system has been designed to efficiently track the sun along a 138-degree sweep. In addition, the system is entirely self sufficient, drawing on sustainable solar energy and turning the LED lights within a specific threshold of brightness. Besides saving municipalities across the U.S considerable expense in maintenance and electric grid fees, Sun-Tracking Solar-Powered LED Street Lights could be used to provide much needed off-grid street lighting for far-flung rural areas and remote areas in other countries. In many parts of the world, streetlights go dark as soon as their incandescent lights burn out or grid rates go up, casting often dangerous neighborhoods in darkness.